Chemists have created a molecular machine that can selectively prepare the four diastereoisomers of a chiral product. The new machine features a pH-responsive rotary switch fixed in a rigid platform with two chiral activating sites of opposite handedness. Using acids and bases, the motor can be spun at different stages of the synthesis to ‘select’ between the four possible final products. Leigh calls these sequences ‘programs’ because they function in a similar manner to a computer program. Two different mechanisms – iminium and enamine activations – determine the final configuration of the products. The absolute configuration is determined by the handedness of the active site during iminium activation. On the other hand, the enamine activation process is responsible for the selection between syn and anti relative configurations. Despite all these different possible pathways, ‘reactions are carried out in one pot, no purification of intermediates is necessary, so that means that they have to be clean’, Leigh explains. He adds that using NMR spectroscopy, ‘we can follow the changing state of the machine during each program’. 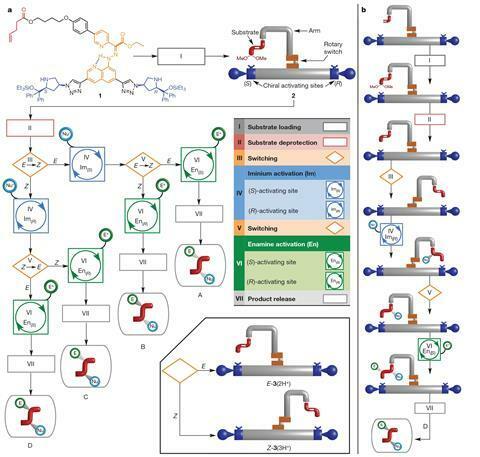 Fraser Stoddart, who shared the chemistry Nobel prize last year for his work on molecular machines, tells Chemistry World that ‘there is little doubt that one of the main and important early applications of artificial molecular machines is going to be in stereoselective synthesis’. ‘The roadmap will be determined only by the imagination and creativity of chemists who enter the field,’ he says.